1. The top chart above shows the remarkable switch over the last several years in the number of U.S. rigs drilling for crude oil compared to the number of rigs drilling for natural gas. 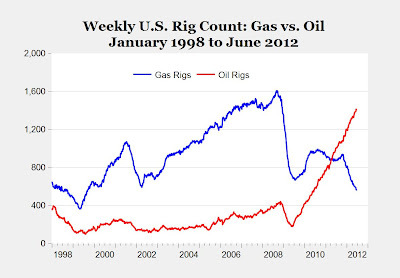 The number of natural gas rigs fell to almost a 13-year low of 562 this week, which is only about one-third of the gas rigs of more than 1,600 at the peak in the summer of 2008, and the lowest for any week since September of 1999. 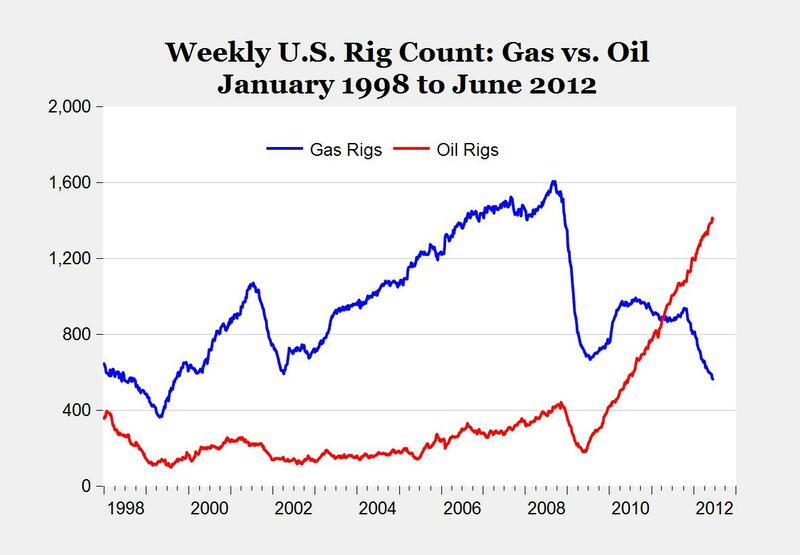 Meanwhile, the number of oil rigs has skyrocketed, from fewer than 200 in the summer of 2009, to more than 1,400 this week, an amazing seven-fold increase in less than three years. Obviously the dramatic switch from gas to oil drilling has been motivated by: a) the record-high supplies of natural gas that have brought prices to record-lows, and b) high oil prices, and is example of how market prices transmit information about relative scarcity, which then automatically bring about changes in behavior by suppliers (find and produce more oil, produce less gas) and consumers (use more natural gas, less oil). Notice also that there was no national energy policy that facilitated the switch, and neither politicians nor the Department of Energy was involved; it happened naturally and automatically due to the economic principles of market prices, profit maximization, and the invisible hand. 2. 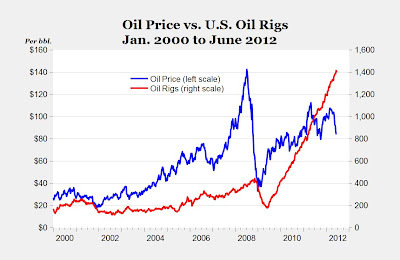 The bottom chart shows the relationship since 2000 between the number of U.S. oil rigs and the price of crude oil (WTI). As U.S. oil rigs increased 7 times over the last three years, it brought U.S. crude oil production to a level we haven't seen since 1998, fourteen years ago. Note that the record high number of oil rigs and increased oil production has also been associated with a period of fairly stable, and now falling oil prices over the last three months. Has the remarkable increase in U.S. oil production had any moderating impact on crude oil prices? Probably. "According to the old script, United States oil production was too marginal to affect world oil prices. But the gap today between demand and available supply on the world oil market is narrow. The additional oil Saudi Arabia is putting into the market will help replace Iranian exports as they are increasingly squeezed out of the market by sanctions that start later this month. But if America’s increase of 1.6 million barrels per day since 2008 had not occurred, then the world oil market would be even tighter. We would be looking at much higher prices — and voters would be even angrier." In other words, supply matters. The increased supply of domestic natural gas certainly had an effect on gas prices, and the increased supply of domestic crude oil is likely also having an effect on oil and gas prices. I don't know. 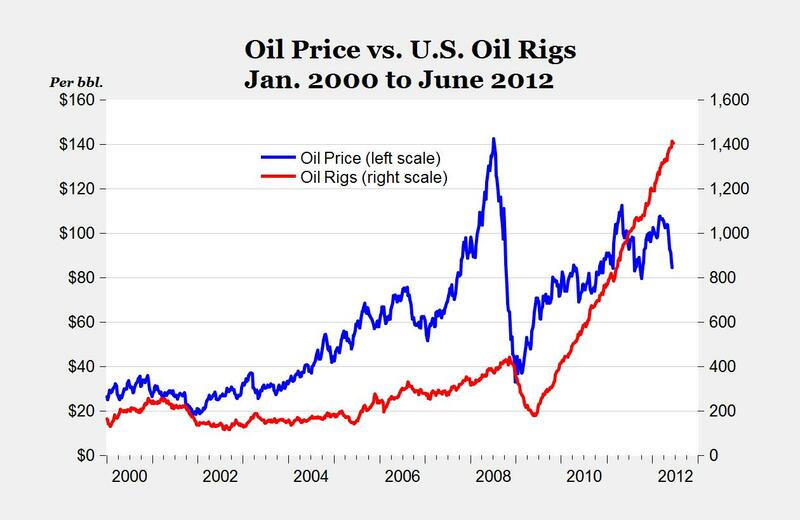 I have the solemn word of that renowned economist, Bill O'Reilly, that oil prices are determined by Speculators. "I don't know. I have the solemn word of that renowned economist, Bill O'Reilly, that oil prices are determined by Speculators." I wish he wouldn't make such ignorant claims. I'm almost embarrassed for him. I like some of the things he says, but when it comes to economics he falls flat on his face. Profit matters too. The shale gas producers only survived because they were adding debt to their balance sheets. Now that lenders are weary they are scrambling to sell off valuable assets just to stay alive. That is not a foundation for a real boom and anyone who understands how tight gas and oil formations work knows just how desperate you have to go in order to try to develop such deposits. The increase in oil rugs is Obama's fault. WSJ: "We're in an era of unprecedented private-equity investment in the oil patch. In the first quarter of 2012, U.S. private-equity oil-and-gas deals reached their highest level in at least 20 years, with more than $11.5 billion in transactions, according to PricewaterhouseCoopers." Guess they should have checked with VangeIV before making those billions of dollars in ill-advised oil and gas investments? "The increase in oil rugs is Obama's fault." What is an oil rug? You still don't seem to understand how private equity and Wall Street work. If you get in early and sell to a bigger fool before the bubble bursts you do not have to worry all that much about profitability or viability. As long as the useful fools in academia and the media do their jobs and spread the hype you can become rich by selling overvalued or worthless assets to people who chase momentum or are totally ignorant of either the market action or the fundamentals. There are always at least two sides on an issue. When dealing with hype and promotion, as we are when we look at tight oil and gas production, our friends do not really care about logic or the facts. Such things only get in the way of the narrative and ruin the spin that they want to advance. Of course, after the bubble has burst they will pretend how the bubble was obvious and will deny that they helped act as promoters rather than reasonable actors looking to shed a little light on the subject.